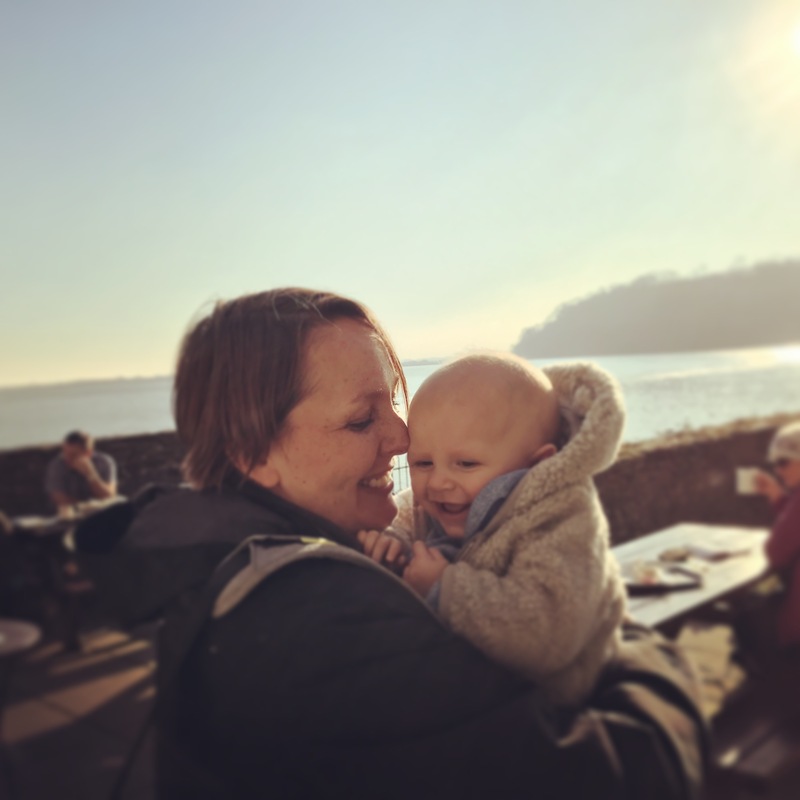 It is AGES since I wrote my last Cookbook Challenge – naughty me, I am so behind with blog posts. 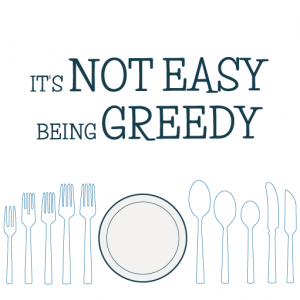 But it’s great to do, as the rule with the Cookbook Challenge is that I have to follow the recipe. Because I am such a confident cook, I often use recipes as a guide rather than strict instruction. That’s good when it makes a dish suit my tastes more, but means I can miss what the recipe writer actually wanted to convey in the dish. So, Andrew bought me Nadiya Hussain’s British Food Adventures book a few weeks ago after he recognised my addiction to the TV series which it accompanies. 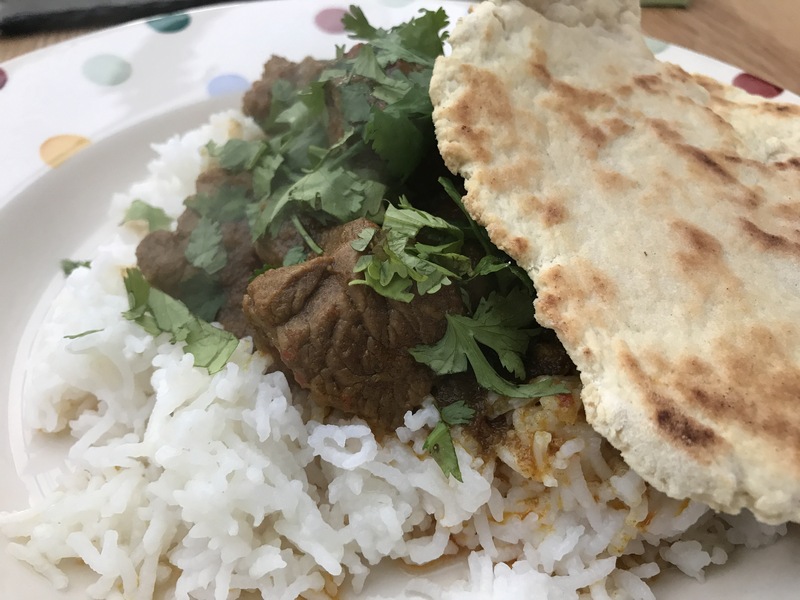 There are loads of gorgeous recipes in there, but the one I first wanted to try was Nadiya’s lamb bhuna with homemade garlic naan bread. That’s because bhuna is one of Andrew’s favourite Indian dishes, and I have never made it. 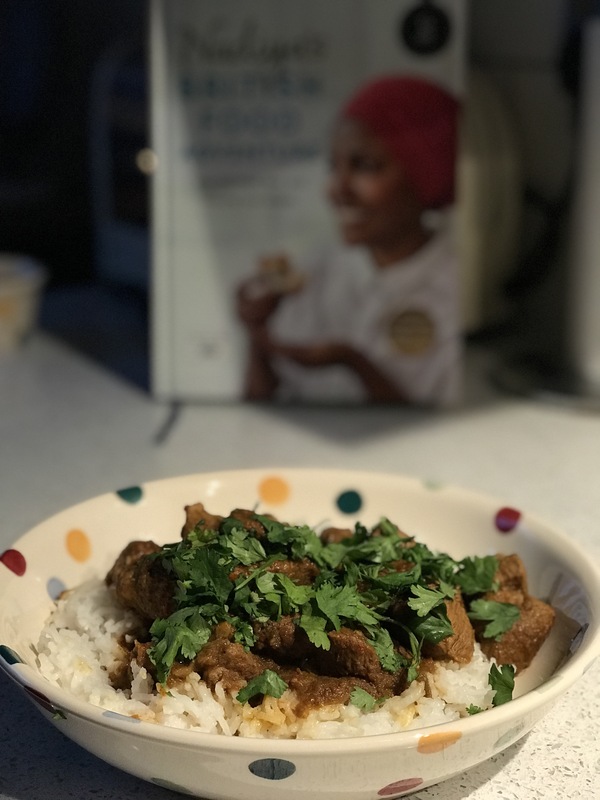 With Indian food it is better to follow the recipe exactly as given unless you are a spice expert, which my am most certainly not, and the great thing about Nadiya’s recipe is that it was very simple with relatively few ingredients. 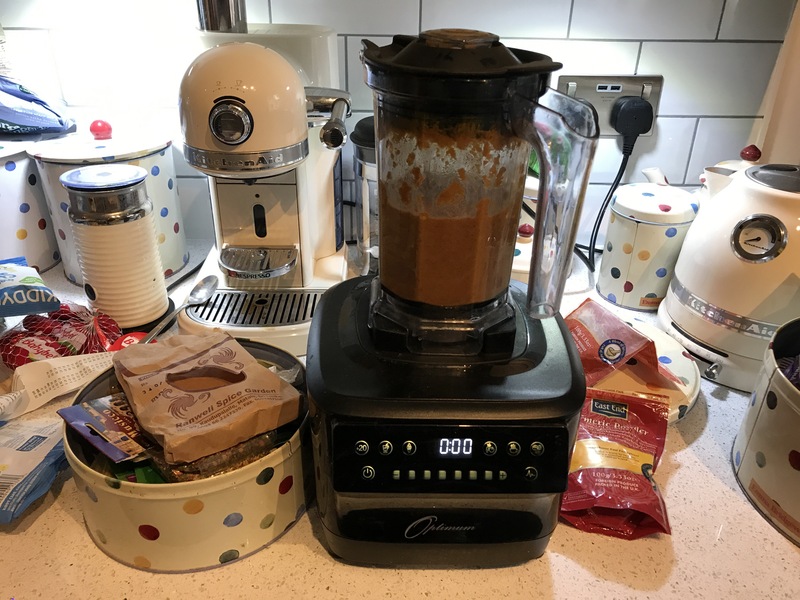 Firstly, I made the curry paste in my Froothie Optimum g2.3 Platinum Series induction blender* – my supersonic blender whizzed up the sauce in seconds which took the hassle out of the job (although I probably should have used my larger blender jug – it nearly escaped from my mini blender jug). What I found interesting was that the onions were blended up in with the spices, so there were no sliced onions in the finished curry. It worked so well but I never would have tried it without following Nadiya’s recipe. Nadiya’s recipe suggests olive oil but I didn’t have enough so I used vegetable oil, and I used lazy garlic and ginger instead of the fresh stuff. All you have to do then is heat half of the curry paste in a pan for 10 minutes (the recipe make enough for two portions so I have the other half in my freezer, which is a pretty nice feeling), then add the diced lamb leg and cook for 10 more minutes, then add some water and cook for 30 minutes. Super easy! I really didn’t expect the meat to be tender in 40 minutes of cooking time but it was beautifully soft and delicious. While the lamb was cooking I made the naan (again, something I had never made). You are supposed to mix flour, garlic granules, sugar and salt together, rub in butter, then mix with water (Nadiya doesn’t say how much in her recipe – I’d say start with 50mls and add more if the dough is too dry) and knead for 5 minutes, then leave to rest for 20 minutes. Then just split the dough into two, roll into ovals, and dry fry in a frying pan or griddle for 3 minutes each side and brush with melted butter. So simple! So, I served my curry and naan with basmati rice and mango chutney, and although it was delicious, the curry was really much too spicy for my taste, and had too much liquid. Next time (with the other half of my curry paste) I will replace the 200g water with a tin of coconut milk, and will simmer the curry with the lid off so the liquid reduces more. As for the naan breads, well they tasted very authentic but were strangely flaky, and I wonder if I didn’t soften the butter enough before I rubbed it into the dough … I loved my discovery of garlic granules though – I need to find some new recipes to use them in. Make the curry paste by blitzing all of the curry ingredients except the lamb, coriander and 200ml water together. Heat half of the mixture in a large saucepan (the other half can be saved for future use) for 10 minutes, stirring regularly. Then add the lamb and cook for another 10 minutes, again, stirring all the time so that it doesn’t catch. Add the 200ml remaining water (or replace with a can of coconut milk) and simmer gently with the lid off for 30 minutes. 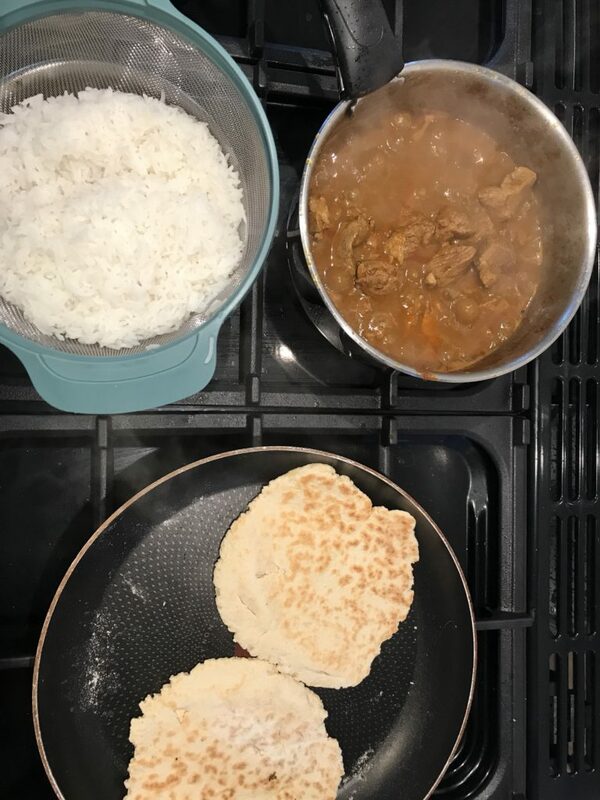 Make the naan bread when you leave the curry to simmer: mix the flour, garlic granules, sugar and salt together and then rub in the softened butter. Add the water and mix until you form a dough (add extra water as necessary, a little at a time), knead for 5 minutes and then wrap in clingfilm and leave to rest for 20 minutes. Wash your hands at this point because the garlic granules will make them STINK! When ready, put a large frying pan on to heat up while you split the dough into two and roll into ovals (around the thickness of a £1 coin), and dry fry for 3 minutes each side, then brush with melted butter. Serve with basmati rice, scattered with coriander. Well done for following the recipe. I’m really rubbish at that and as you say, sometimes it’s a good thing to do. 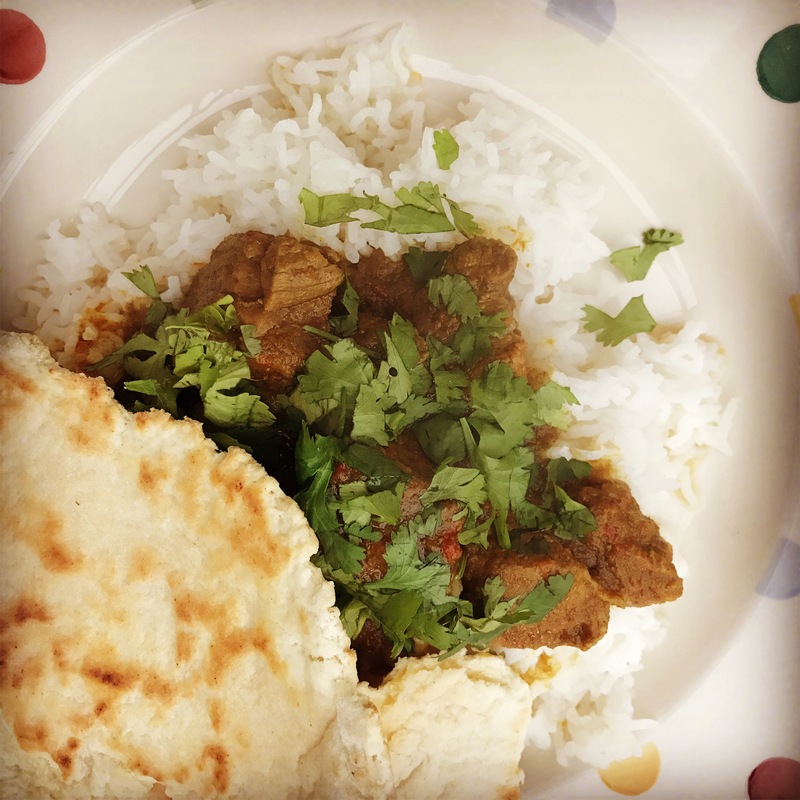 I do love a good curry and making your own curry paste and naan bread has to be the best. Oh I should not have read this when hungry, it looks so good and I really could eat a HUGE bowl right now. I love lamb bhuna and I’m definitely a bread over rice girl too! YUM!